The other day we told you that Unlocked Mobiles in the U.K. was taking pre-orders for the unlocked SIM free version of the BlackBerry Q5. Now, a trio of carriers in the country has the device available for a subsidized price. Before we pass along that information, it would behoove us to refresh your memory. 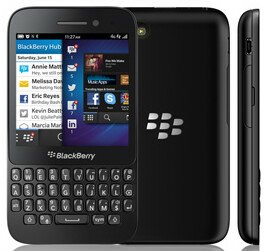 The BlackBerry Q5 is a low to mid-range version of the Canadian manufacturer's QWERTY equipped BlackBerry Q10. It has the same 3.1 inch 720 x 720 square display, but the physical QWERTY keyboard is much more basic than the one on the Q10. BlackBerry U.K. has put up a single website that allows you to pre-order the Q5 from EE, Orange or T-Mobile U.K. First, you select either black or white, and then the carrier you want. Orange is giving the handset away for free with a £26 ($41 USD) monthly plan that you are locked into for 2 years. You receive 250 minutes of talk, unlimited texts and 750MB of data. For the same monthly price, T-Mobile U.K. gives you the phone with 300 minutes of talk, 500 texts and 1GB of data. Again, a 2-year contract is required. If you want 4G LTE service, EE is your play. For as low as £31 ($49 USD) a month over 24 months, you will get the BlackBerry Q5 for free. This plan offers unlimited calls and texts along with 500MB of data. For £41 ($64 USD) a month, the data portion of the plan rises to 1GB. 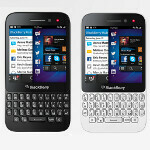 While the three carriers are taking pre-orders for the BlackBerry Q5, no launch date for the phone has been announced.